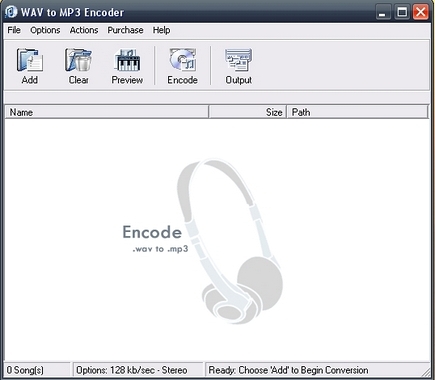 Wav to Mp3 Encoder is easy to use software which will convert your huge collection of Wav music files into Mp3 songs. Wav is a Microsoft and IBM File Format for storing an audio file. The songs in Wav file format are uncompressed and have a high quality. Wav music files consume huge space, as a result it was difficult to share music files with wav format via Internet, and this resulted in the development of Mp3 file format. Unlike Wav, Mp3 consumes less space and can be used in portable players, but Mp3 is said to have lower sound quality. If you have a huge collection of songs in Wav file format and your hard disk is full, then it is time to convert your wav music file into mp3 with Wav to Mp3 Encoder. The software is free and has got a simple interface. Just click on ‘Add Files’ to select multiple wav music files, choose the output directory and click on encode. It will take few minutes to convert the wav music file into mp3. You can also change the Bitrate and stereo or mono channel type for improved sound quality. If in case file size of Wav Music file is 30 MB after its conversion into Mp3 format the file size will be near to 3 MB.
. Options to change the Bitrate of Mp3 file.